There are few things that shock me, but this information stopped me in my tracks: Each year 70 thousands dogs are tested on in facilities located here in the United States. I am told the preferred breed of dog is the Beagle. 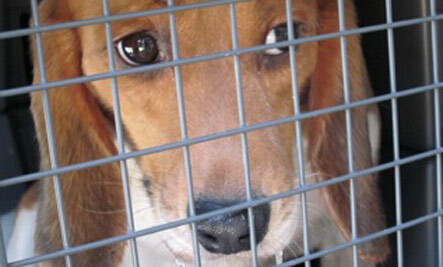 According to Peta and Beagle Freedom Project, the dogs are tested on because of their kind, docile nature. The tests include experimental surgical procedures, toxicology tests, and over the counter drugs. I am also told that most of the dogs are actually bred to be a “lab rat.” They live in a cage their entire lives never seeing the sunshine or stepping on grass, (much like Puppy Mill dogs). It is legal to test on dogs in the United States, just as it is legal to test on cats, rabbits, primates and rats, but animal activists that I have interviewed and discussed this issue with are fighting back. Their reports claim some of the facilities beat and kick the dogs, and leave them living in deplorable living conditions. In fact, just last week, a North Carolina grand jury indicted four facility workers on 14 felony cruelty to animal charges. It is the first time in U.S. history that workers have faced felony cruelty charges for their treatment of animals in a lab. There is not much we can do about it. Believe me, I have tried to figure out how this madness could be prevented, but there are choices we can make as consumers. We can make these choices daily, and encourage our friends and family to do the same. Please learn more and educate others about these practices. Together we can make a difference.